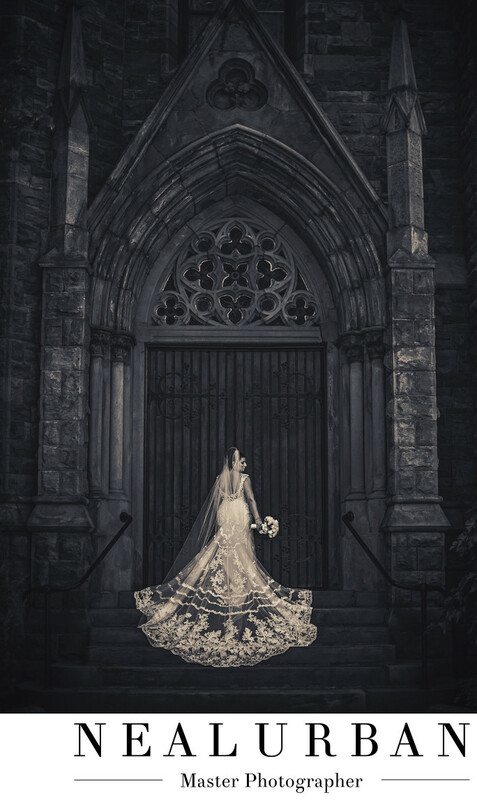 This is another one of our favorite bridal portraits. This was from Justin and Melissa's wedding. The ceremony was at St. Louis RC Church and reception at Salvatore's Italian Gardens. This was right outside of the church. St. Louis has amazing doors. The detail on the building is beautiful. We love different textures. And we got so many different textures here. To make this photo even better, was Melissa's wedding dress. She had the most stunning train. It was lace and sheer material. The dress looked antique and she looked gorgeous. It was just starting to rain a little, but we couldn't leave without getting this shot. Melissa was up for it, so we made sure it was spot on. After her dress was laid out and perfect, we had the bride look over her shoulder and down toward her flowers. This was just enough to get a bit of profile. To make this image even more jaw dropping, was to turn it to black and white. Neal does not just click a button to turn an image black and white. He does the colors changes manually to control how light and dark the blacks are (we shoot everything in color). This picture looked great right out of the camera in color, but we wanted it to be more dramatic. Melissa's dress and details stood out a bit more as well. Not all photos work as black and white. Images that show a lot of emotion tend to look great. Then there are some like this, that scream to have a more dramatic feel. Neal knew right when he took this photo, it would be black and white! Location: 35 Edward St. Buffalo NY 14202 United States.